Arab men fill the airy and glass-walled lobby of the Royal Rimonim Hotel. They sit on upholstered chairs around low tables and play cards at this gleaming tower along the shore of Israel’s Dead Sea. Some rotate rosaries through fidgety fingers. Women in diaphanous white head scarves and black outfits cluster around other tables, drinking coffee out of a silver thermos. I don’t normally frequent hotels such as this one, with its sleek exterior, modern decor, and a spa whose indoor pools are filled with heated sea water, even though the beach is a short distance away. Normally I avoid the pretentious and the fancy, preferring homey and low-key buildings with ground floor rooms and gardens outside. But my pilgrimage in Spain last fall created a new “normal”, at least for awhile; until my tendonitis heals I can’t walk long distances or run up and down stairs. And this situation almost kept me from attending my middle niece’s upcoming Bat Mitzvah in Jerusalem. That hilly city is best seen on foot, and there are sections of the celebratory itinerary that I won’t be able to join. For weeks, I was on the fence about whether to go, since I wouldn’t be able to explore as I usually do. I was inclined to decline the invitation, until I decided to put on my “possibility” cap. Was there a way I could not only make the trip but also make it an adventure? Several years ago I spent a few months in Israel, auditioning it as a place to live. While it didn’t feel like home, I did enjoy a trip to the Dead Sea, whose salt-saturated water keeps bathers afloat. Perhaps I could relax there while washing away jet lag; with nothing to do other than soak, eat and sleep, I could give my tendon an even longer rest. I went online to research hotels. Because Passover was approaching, when Israelis go on vacation and Jews visit Israel, many of the more modest lodgings were already booked. Several quaint places were off the beaten path and I didn’t want to rent a car. I considered abandoning the idea, but that didn’t feel right, either. Since I was planning to spend nearly 24 hours in transit each way, and might not return any time soon, why not make the most of it, especially since my ability to see Jerusalem would be limited? After hours of scrutinizing ratings and reviews, I concluded that the available hotels were equally expensive but differently flawed. Customer service is not an Israeli strength; even lavish hotels lapse. With no obviously outstanding candidate, I decided to go by name. “Rimonim” (pomegranates) is the title of one of my artworks. And, in a personal growth workshop I recently attended, someone used “royal” to describe me. Perhaps this hotel would shed light on the meaning of that word? My room, which has views of both the Dead Sea and the rugged desert hills behind, is exponentially more lavish than the albergues along the Camino, despite the stained, worn carpet and a bathroom screaming for regrouting. But, despite the price tag, the front desk staff range from indifferent to grudgingly accommodating, like many of the Spanish hospitaleros I encountered. Here, “royal” treatment does not mean being waited on hand and foot or having needs anticipated. Indeed, I had to remind them to clean my room (which, when completed, didn’t involve any actual cleaning), pointed out that the poolside water canister was empty (despite a sign urging guests to drink), chased down waiters for hot water at breakfast and twice had to explain that the package I booked (through the hotel’s website) included things the front desk wanted to charge me for. Did King David tolerate such inattentiveness? But, just like on the Camino, where a good meal could redeem a slog of a day and even a sleepless night, the Royal knows its food, and the dining staff smile and make small talk. Every morning and evening, the Royal serves a feast fit for a king, enough for an entire kingdom. 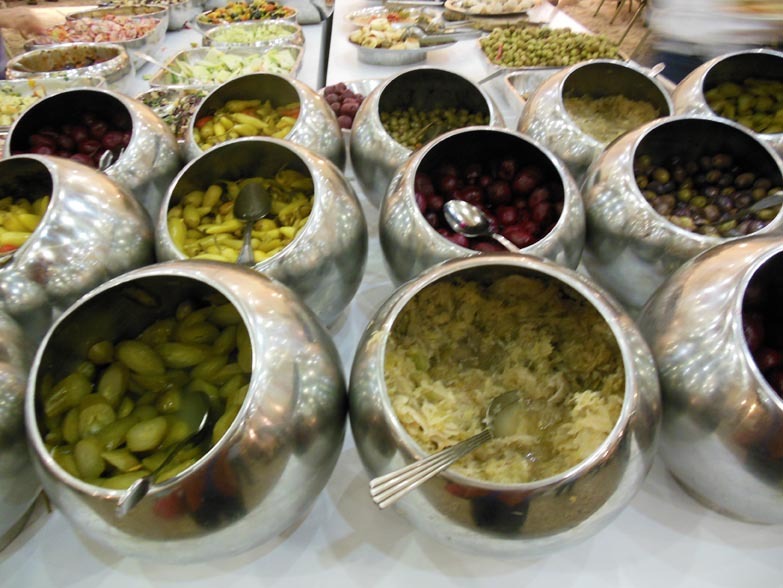 Dinner begins with at least a dozen different fresh salads, bowls overflowing with couscous, hummus, olives, sauerkraut, pickled peppers, plus platters of grilled vegetables, gleaming with olive oil. That would be enough for a hearty supper, except there are at least 10 hot dishes — meats, fish, rice and more — plus a rainbow of desserts, miniature layer cakes, poppyseed and fruit squares, sorbet, and fresh pears, kiwis, persimmons. Had I sampled just one spoonful of every prepared dish, and taken a bite of each type of fruit, it would have been too much for one meal. Breakfast, with at least ten varieties of hard, soft and cream cheeses, plus salads, eggs in different styles, herring every which way, whole and peeled fruit, pastry, pizza, and a cornucopia of breads, is equally mindboggling. Some would call the riot of color, textures, flavors and quantities “abundant”. Obscene came to mind, considering that guests have probably not done anything more strenuous than marinating in brine. Several Russian speakers, bellies spilling over waistbands, piled pastries on napkins to take to their rooms. A tiny lady obscured by a head scarf filled a plastic bag with packets of jam, like an unabashed trick-or-treater. Other diners heaped plates with one of everything, only to leave much to be scraped into the trash. This paradise for gluttons is a painful reminder to this Pilgrim that such excess is considered, if not “normal”, at least desirable. The Camino’s main teaching is to take only what you need, both on your back and in your belly. One can walk quite far on surprisingly little food. Overindulging will slow you down. But the Camino offered many other lessons, including accepting things as they are. While the pilgrimage makes it possible to free one’s spirit from routine, a sedentary life and attachments, the Dead Sea creates the opportunity to both soothe and indulge the flesh. Here, it’s all about the body, whether it is saggy or flabby, hairy or plucked, wrinkled or smooth, dry or oily, svelte or corpulent, healthy or handicapped. The lack of self-consciousness with which zaftig and elderly women stroll about in bikinis is refreshing. Perhaps they are the closest to “royalty” here, carrying their scars, cellulite and sun spots as if they were jewels in the crowns of their lives, not something to camouflage, nip or tuck. Now that is something I can chew on, since I can’t take another bite. « What Are You Really Searching For?